If you know your kiwi fruit facts, you are aware that the small, exotic fruit is more than just delicious; it's also a nutritional powerhouse. The kiwi fruit, also known as the Chinese gooseberry, originally came to New Zealand via missionaries from China in the early 20th century. 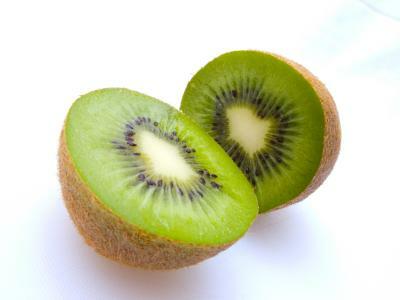 However, the small and unique fruits didn't make it to the United States until 1961, when a produce distributor took note of the kiwi's fuzzy brown skin and bright green flesh and recognized the potential demand for a new exotic fruit. Today, the kiwi fruit soars in both popularity and recognition, and it is grown commercially in a number of countries including the United States, Chile, France, Italy, Japan, and New Zealand. In rare instances, people who are allergic to kiwi fruit may experience a life-threatening reaction known as anaphylaxis. The symptoms come on quickly and must be treated as a medical emergency. Studies have shown that children are at a greater risk for a severe allergic reaction to kiwi fruit. Most people prefer to peel kiwi fruit before eating them. However, the skin is edible if you can get past the fuzzy texture. Many people agree that kiwis are delicious, but not everyone agrees about what they taste like. Some people think the juicy green flesh tastes similar to strawberries, while others compare them to melons or grapes. In some cases, people have compared them to bananas, but that comparison may have more to do with the tiny black seeds that ring the center of the fruit. Truthfully, kiwi has a unique sweet flavor all its own. Kiwi fruit make a nice addition to any vegetarian or vegan diet, including a raw food diet, as long as you aren't allergic to them. They are a low-fat, tasty option that's high in antioxidants, and they have a flavor that complements other fruits. Kiwis also make a healthy addition to fruit smoothies or a nice appetizer when paired with cheese. Whether you choose to eat kiwi fruit alone or as part of a dish, it's one little fruit that is sure to please your taste buds.